The Statue of Unity is World’s tallest statue and opened for the public from 31st October. 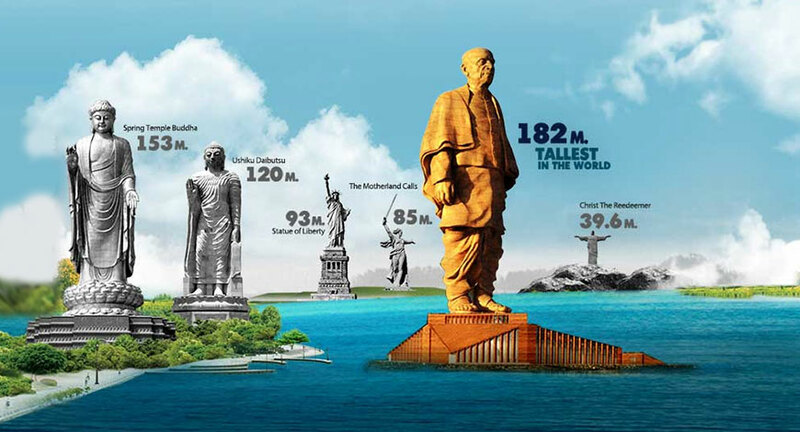 You will amaze that the statue of Sardar Patel is twice as tall as the Statue of Liberty with a height of 182 meters. This massive statue located at Sadhu Bet, Narmada district of Gujarat. With the Statue of unity inauguration, it is expected that it will be a major tourist attraction and roughly attract around 10,000 tourists daily. The gallery within the statue will offer tourists the scenic vistas of the river Narmada, the surrounding Saputara range of hills and the Sardar Sarovar Dam. A visitor can visit the galley within statute by taking the lift installed inside it. The lift run at a speed of 4 m/s. This gallery is at the height of 135 meters and close to the chest of the statue. An exhibition hall and museum have also been built inside the giant structure of India’s Iron Man, showing the life of Sardar Vallabh Bhai Patel. The complex has a selfie point for those who want to click a perfect selfie with a good view of surrounding and statue. You can also visit the museum and audio-visual gallery. But the question is how to reach this Narmada Tent City? Then do not confuse as the answer is here with the specialty of tent city. How Can You Reach The Statue Of Unity And Tent City? The Statue of Unity located at the Sadhu Bet hill and facing the Narmada Dam near Rajpipla. The tent city set up in the same site with a total area of 70,000 square meter area with facilities like road, power supply, drinking water and transportation. To visit the city, you have to travel 100 kilometers from the city of Vadodara in the southeast direction. And around 200 kilometers from Ahmedabad. If you are traveling from Mumbai, then it will be around 420 km away via road. If you want to travel through Ahmedabad, then you can reach your destination starting from NE1 and take the exit from NH 48/NH64. Then follow GJ SH 11 and GJ SH 63 to NH953 in Devaliya and from here turn right on to NH953. Now drive to Statue of Unity Road. If you want to go from Vadodara, then take the route of GJ SH 11 and drive along GJ SH 63. From there drive to Statue of Unity Road. If you want to visit the tent city from Mumbai, then two ways are via NH 48 and NH160. For NH48: Follow NH 48 to Mulad and take GJ SH 64 to NH953 in Rajpipla, continue onto NH953. Pass by BrcBhavanVavdi, Nandod and drive to Statue of Unity Road. For NH160: Follow NH160 to Dr. NanasahebDharmadhikari Marg in Amrutdham, Nashik and then Saputara-Nasik Rd, Surgana Vani Link Road, Dalwat Link Rd, and Umbarthan Rd to NH360 in Ambabari. Follow NH360 to Bhomapardi – Kanjan Rd and from there take GJ SH 5 to NH953. Follow NH953 and drive to Statue of Unity Road. Statue of Unity Tour Guide: What is Inside and Outside the Statue of Unity? Copyright © 2018 narmadatentcity.info. All Rights Reserved.